When you publish content on your site, it's sent to Amazon Polly for synthesis. By default, Amazon Polly stores new audio files on your web server. You can also store the files on Amazon Simple Storage Service (Amazon S3) or on Amazon CloudFront, which is a global content delivery network (CDN). For audio files stored on the WordPress server, files are broadcast directly from the server. 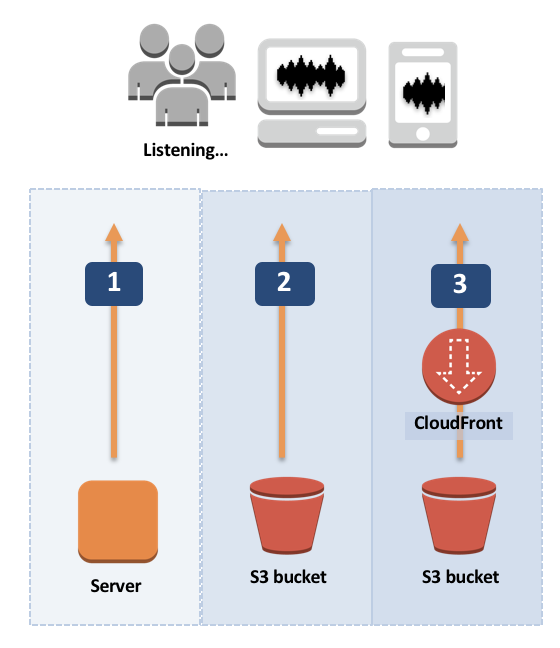 For files stored in an S3 bucket, files are broadcast from the bucket. If you use CloudFront, the files are stored on Amazon S3 and are broadcast with CloudFront. You can choose where to store your files when you install the Amazon Polly plugin. When you install the Amazon Polly plugin, it displays an HTML player at the top of your WordPress website by default unless you choose to display it under your site's text or to not display it. You can reposition the player, remove it, or add it (if you chose not to display it) at any time. On the WordPress Admin page, choose Settings. On the Amazon Polly Settings page, for Player position, choose the appropriate option. For more information about setting configuration options, see Install and Configure the Plugin. With Amazon Pollycast feeds., your visitors can listen to your audio content using standard podcast applications. RSS 2.0-compliant Pollycast feeds provide the XML data needed to aggregate podcasts by popular mobile podcast applications, such as iTunes, and podcast directories. On the Amazon Polly Settings page, choose ITunes explicit.